What Navy fans need to know as the Mids prepare to wrap up 2012.
Who, where, when: Navy (8-4) vs. Arizona State (7-5, 5-4 Pac-12), AT&T Park in San Francisco, Saturday, 4 p.m. Eastern (1 p.m. Pacific). TV: ESPN2 (Dave Pasch and Brian Griese have the call). Gambling is illegal in most states: Arizona State is a 14-point favorite. 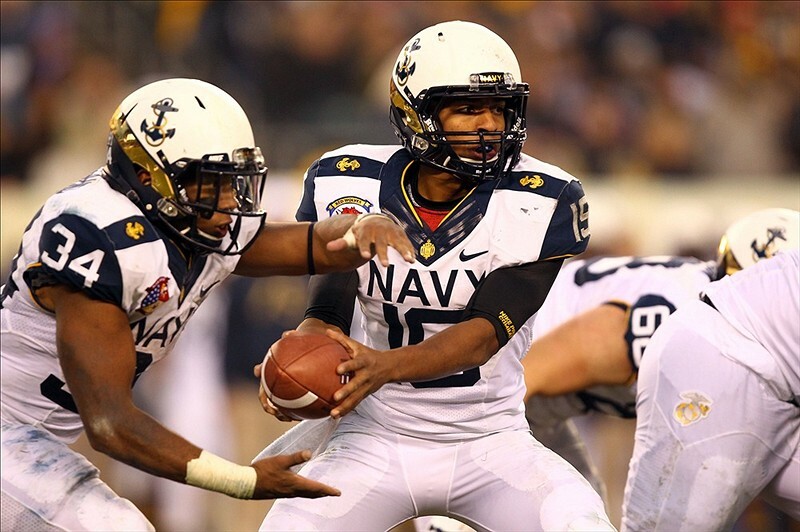 How they got here: Navy’s known its postseason fate for a while — a Nov. 3 win over Florida Atlantic made the Mids bowl-eligible, and they were locked into the Kraft Fight Hunger Bowl via a preseason agreement. As for momentum … it doesn’t get much stronger than a win over Army, but even though the Mids have one of the shorter layoffs faced by bowl teams, it’ll be three weeks between games. Arizona State snapped a four-game losing streak by beating Washington State 46-7 on Nov. 17 to become bowl-eligible, then downed rival Arizona 41-34 to cap the regular season. When Navy has the ball: Navy freshman Keenan Reynolds showed some passing prowess while engineering the game-winning drive over Army, but don’t expect the Mids to stray too far from their option attack: fullback Noah Copeland up the middle, slotback Gee Gee Greene around the edges, Reynolds pretty much everywhere. AZCentral.com covers it well here, with the usual opposing-team-tries-to-deal-with-the-option-offense story. It’s a good read that stresses the importance of discipline and patience. Whether the ASU players can display either will help determine whether this game will be close. When ASU has the ball: Junior Chris Coyle needs three catches to break ASU’s all-time record for receptions by a tight end; he’s got 53 so far, including five touchdowns. Running back Marion Grice had almost 160 yards and three touchdowns in the win over Arizona. Redshirt sophomore Taylor Kelly ranks 15th in the nation in pass efficiency and threw touchdowns in 11 of 12 games this season. It’ll fall to senior linebackers Keegan Wetzel and Matt Warrick (three interceptions) to break up the short-range pass attack, with help from senior safety Tra’ves Bush (five pass break-ups). More on Wetzel: He sums up the season — including challenges faced by some of his teammates in the early going — in this well-put-together-piece by Gene Wang at The Washington Post. To win, Navy must …: Embrace its underdog status and not let an 11th-straight win over Army overshadow the current mission. … Not be afraid to stay grounded, using Copeland to batter an ASU defense that has faced only one rushing powerhouse so far this season, giving up more than 400 yards on the ground in a loss to Oregon. … If all else fails, look for Brandon Turner down the sideline.